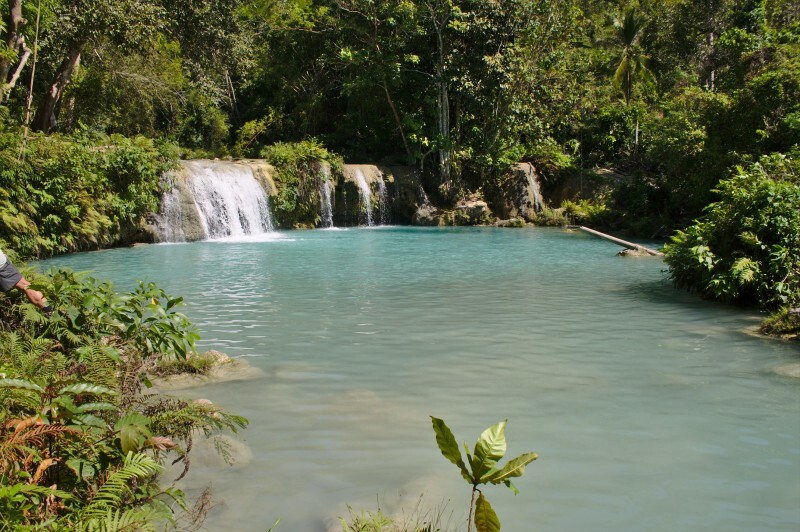 Siquijor (pronounced sicky whore), also known as the Island of Fire is a fascinating destination that shouldn’t be missed when traveling the popular Visayas region (Bohol, Dumaguete, Negros) in the Philippines. 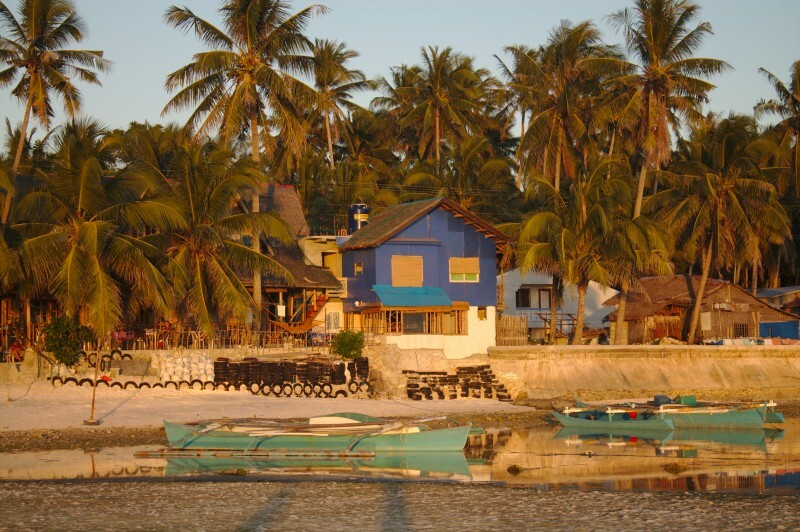 There are several ways to access Siquijor by all the ports of the surrounding main islands. Once you’re in the Philippines you’ll see how easy it is to jump from island to island. Siquijor is the third smallest province of the Philippines, thus perfect for a motorbike roadtrip. 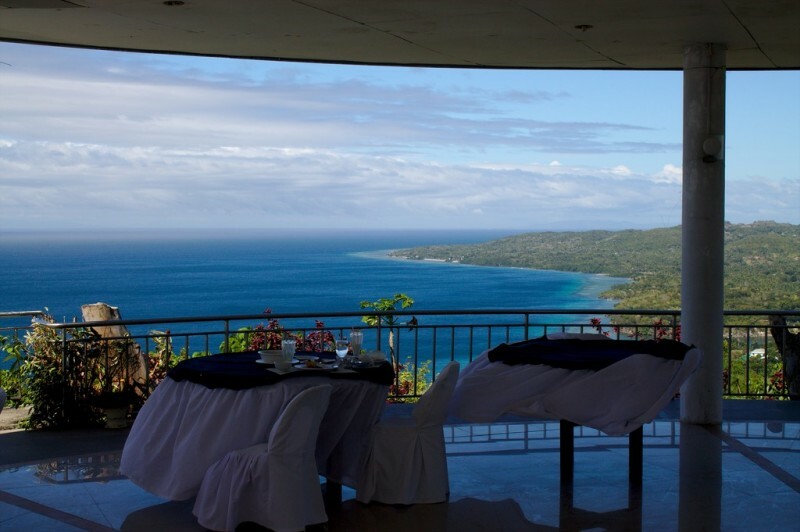 Siquijor has it all. Lonesome beaches, waterfalls, mysterious caves. 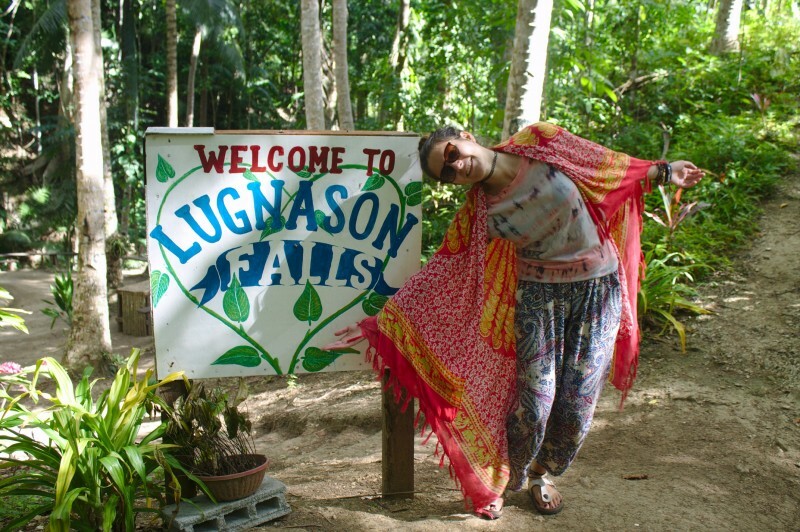 Siquijor is backpacker-friendly. 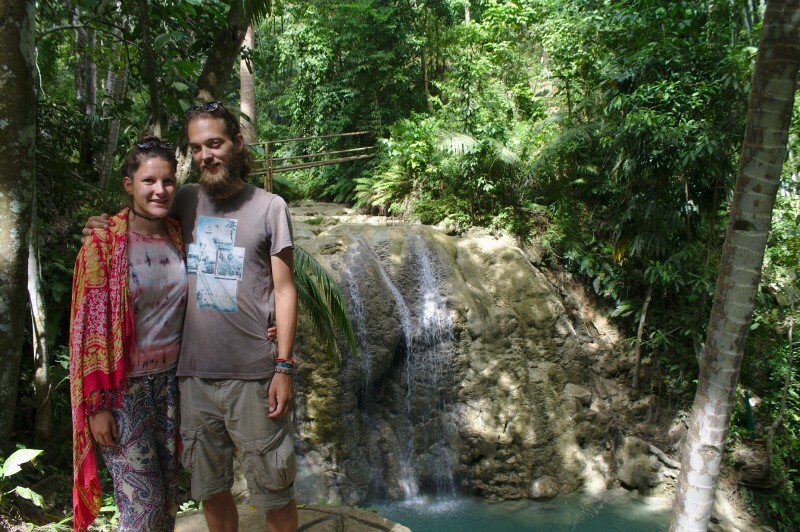 We traveled Siquijor on just € 12 per day, including accommodation, motorbike rent, food and entrances. 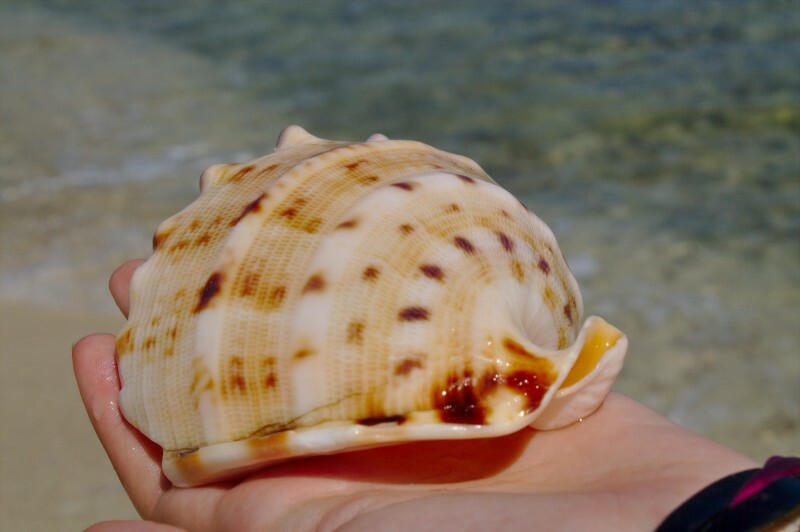 The Filipinos believe that Siquijor is haunted by dark powers and evil energies. Out of fear the locals from the neighbor islands stay away from this bewitched place. Bloggers with a Philippine background encourage their own people to become more open-minded and let the old legends behind. 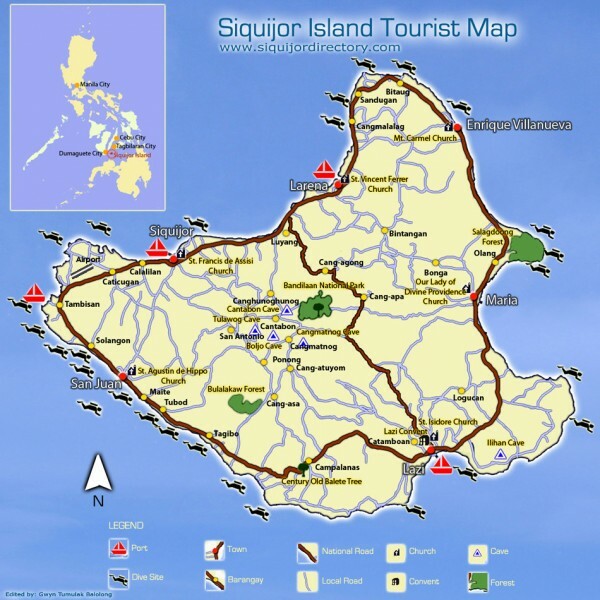 Siquijor is called the island of Fire. Early discoverers saw a glowing from far away. They remembered the mysterious stories about the island and were convinced that they are related to the glowing. The truth behind the ring of fire however were hoards of fireflies buzzing in the floating mangrove trees, which grow at the shores. 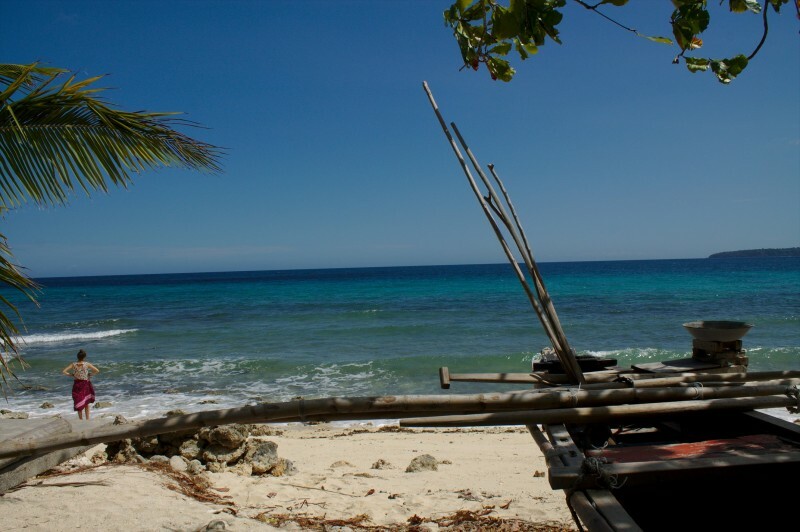 Siquijor remains still relatively unexplored. It’s a quiet, relaxing place where you can still find large stretches of beach completely devoid of people and resorts. We took a ferry from Bohol (Tagbilaran) to Siquijor (Larena). The only way to get around in Siquijor is either by renting a scooter or by taking a tricycle. Tricycles on Siquijor are pricey, especially compared to other places we’ve been to so far. We always prefer to explore a new place on our own. The best way to do so is by renting a scooter. The Philippines is a destination easy to get around with a scooter. Motorbike rentals are very common and you’ll find many of them in San Juan, the backpacker-destination. Motor bikes can be rented from pretty much everywhere on the island, including straight from the docks. Unfortunately, our ferry arrived at midnight – a bit too late to rent a scooter. We had to take a trike. Most rental places ask for 300 or even 350 PHP a day for a scooter – just keep walking until someone wants to give a more honest price; we paid 250 PHP. We had some bad luck with this crappy, old scooter. It was leaking fuel so we returned the scooter and got a brand new one from another place, for the same price. 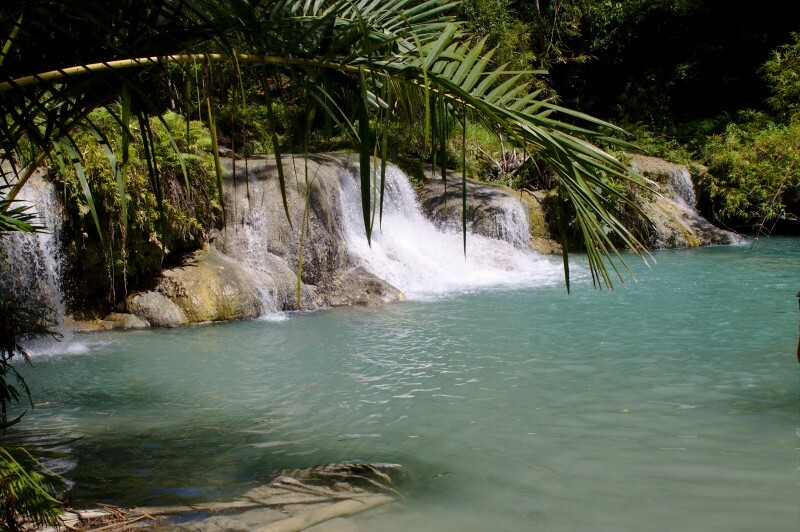 The backpacker places are located in the town of San Juan. San Juan is in the West of the island, offering the best view of the sunsets. We stayed in Casa Miranda, the cheapest option we found. We paid 350 PHP per day for a private room. They have a restaurant with decent prices, however it was a little bit pricey for us. JJ’s Backpackers Village: private cottage for 500 PHP, dorm room: 300 per person; you can also set up your tent on the beach for 400 PHP. Getting food on Siquijor we experienced as not easy. Guesthouses, hostels etc. all sell some food but there were no supermarkets or restaurants. There were just very few shops (two in San Juan) that sold some basics but still not much. Eating cheaper didn’t seem to be possible here. 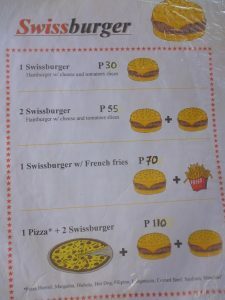 One place we found, offered good prices: Swiss Sternen in Siquijor town. They have a promotion for pizza. Other plates seem cheap but the portions are incredibly small but it seems normal in the Philippines to have very small portions. Both in restaurants and supermarkets; people won’t eat one bag of chips here – they are way too small. Instead, they buy 5 bags or more to get a normal amount. They have an obsession for putting stuff in small plastic packaging but finding a trash can in public is nearly impossible. 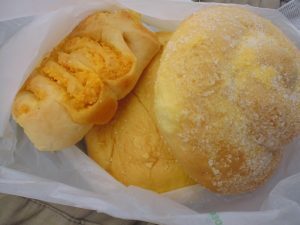 For a quick snack, you can visit one of the bakeshops. They are still affordable. 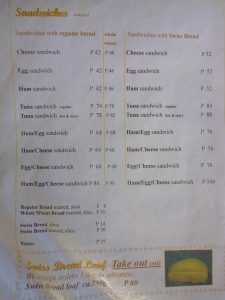 They usually sell sugary bread buns and slices of cake for under 5 PHP. 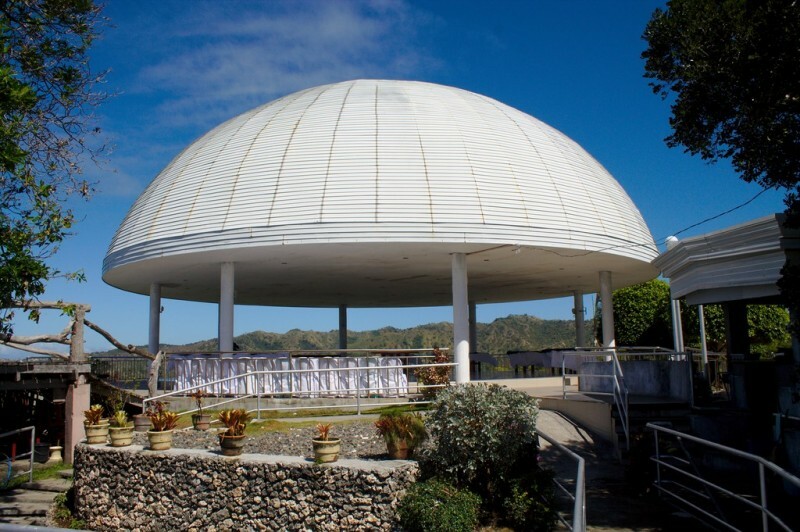 Bakeshops are found in San Juan, Siquijor town and Larena. 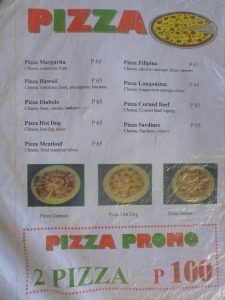 There is also a small food stand in Siquijor town, near the town market. They will make hamburgers, fries, spring rolls for a decent price. 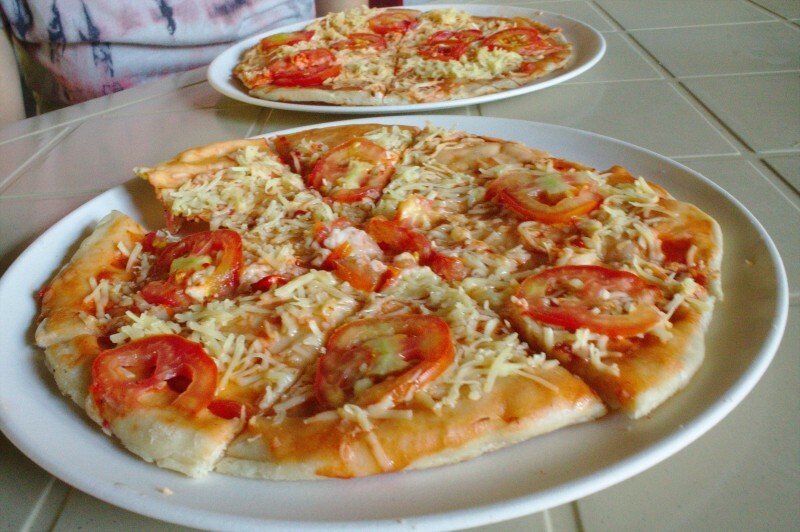 Take advantage of the promotions: two pizzas for 100 PHP at Swiss Sternen in Siquijor town. 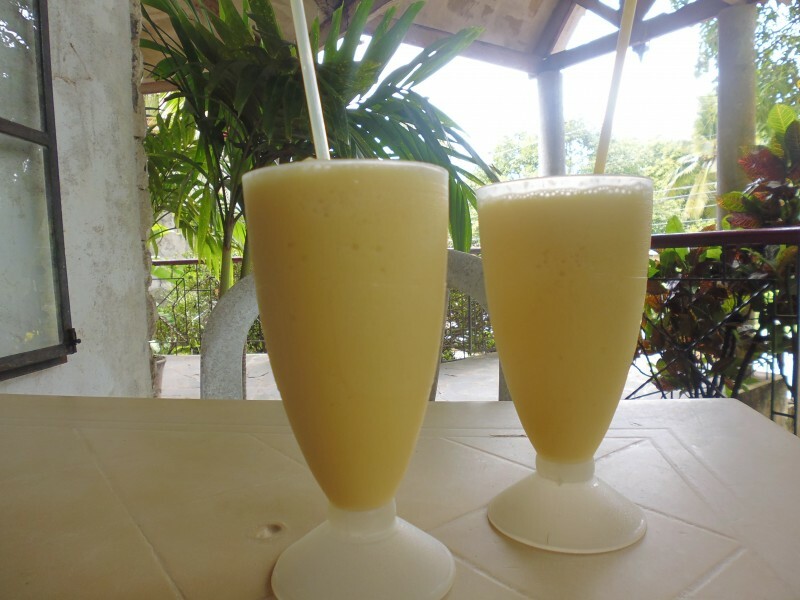 What to do in Siquijor? 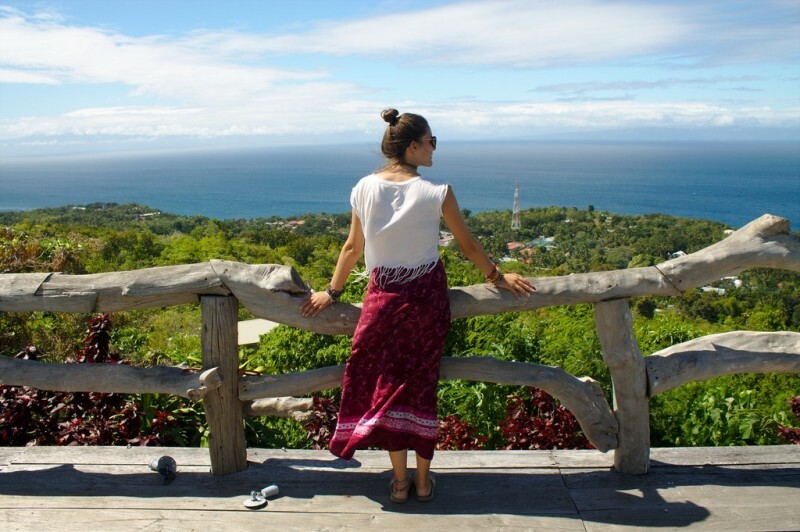 The best thing about small islands is that you can explore them within a few days. We drove around the island starting at San Juan, so our list follows the main route around the island. It’s a roadtrip of about 90 kilometers. It can be easily done in 2 or 3 days, passing all the 6 municipalities San Juan, Siquijor, Larena, Enrique Villanueva, Maria and Lazi. Note that on the East of the island, there are less people and finding a petrol station will be hard. There are enough shops by the road selling fuel in bottles (red and green liquids), slightly more expensive than a petrol station. 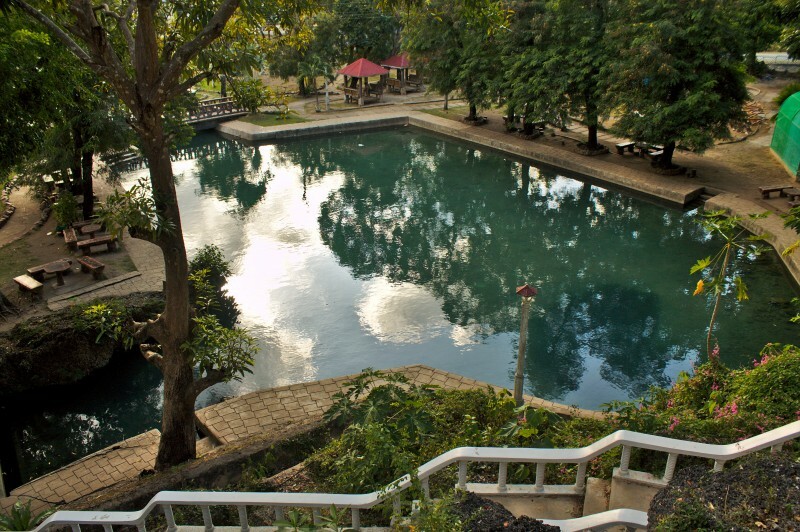 A public swimming pool has been made from a natural spring and is free to access. There usually aren’t many people around. There are some sheltered picknick tables to have a rest or a snack and it’s not far from the beach. Lugnason waterfall isn’t indicated on the maps nor are there any road signs indicating its location. You have to know about this place; it’s unlikely you will coming across it accidentally. It’s on the way to a small village called Napo. Once you arrive there, you’ll find yourself enchanted by the beautiful frame. Blessed by scenic wilderness. Turquoise water so clear that you can see distant what is below you. Feel like a mermaid! The oldest Balete tree (magical tree) of the island, said to be over 400 years old, can be found next to the road on the way to Lazi. It may be easy to miss when passing it – we drove past it at least three times before we knew there was something to see. It’s right between two bends on a hilly road. 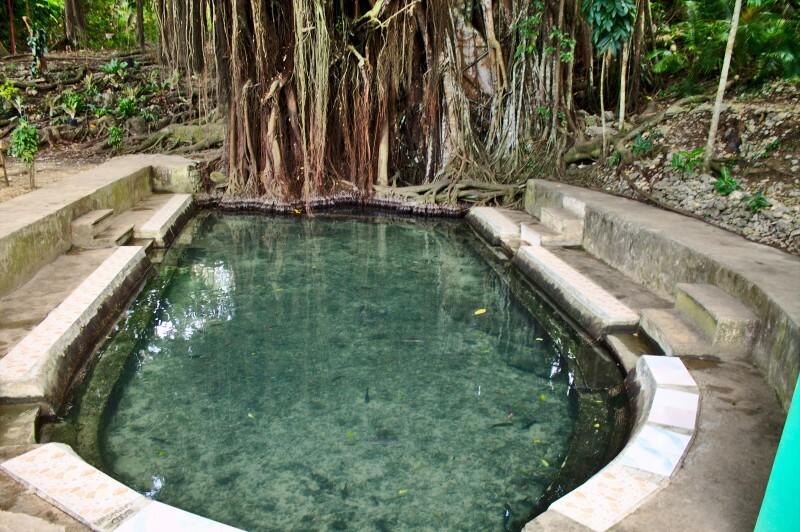 A pool is built next to the tree where you can put your feet in the water with fish eating your dead skin. 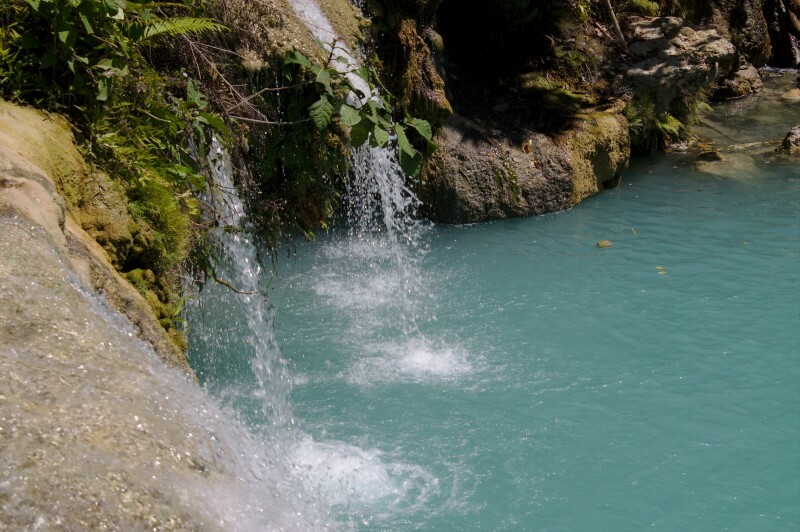 Cambugahay is the famous and more popular waterfall. On the way there, you will pass the old church of Lazi. It’s a popular place to jump from the top of the waterfall and there is a rope to swing from. When we were just about to leave, we found two more waterfalls above the lowest one. The one on the bottom is great for swimming, the next one is smaller and the water is more shallow. It’s a nice place to cool down and it’s less crowded. Then, there is a smaller, third waterfall above this one but it takes a bit of climbing to get there; it has even more shallow water with more rocks. Salagdoong Forest is located on the East of the island. Next to this forest is Salagdoong Beach with a waterslide (15 PHP entree). 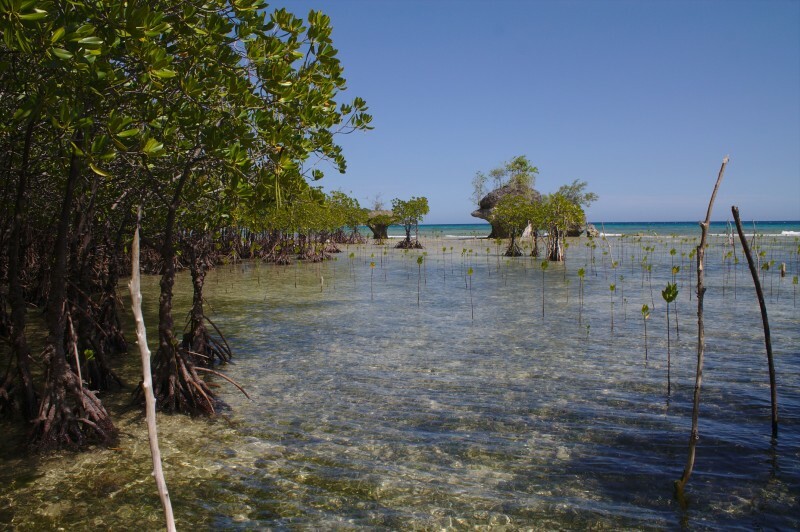 There are bizarre mangrove trees floating in the water on the shores. The trees grow so dense that from far away they look like a little island forest. We found a small road leading to a beautiful beach nearby. 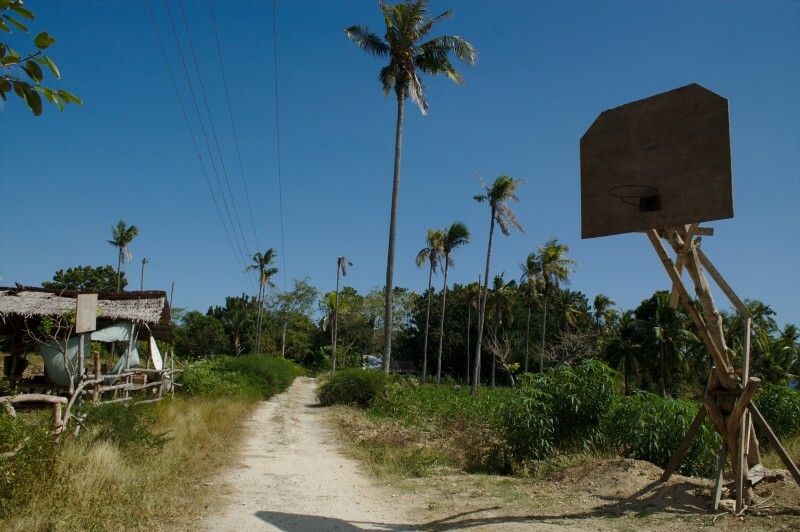 Find the wooden basketball backboard from the picture below and follow that road. 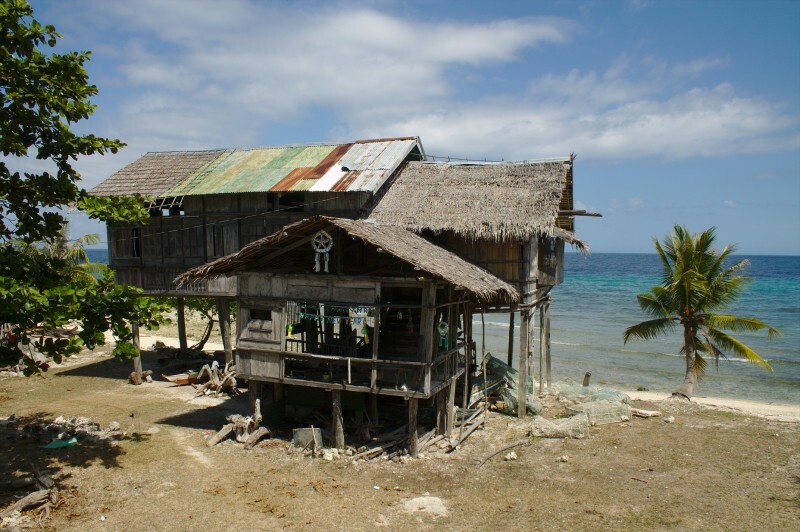 We came across an abandoned fisherman house when we drove around the whole island and later found out it’s a known tourist attraction called Cang-Isok house. The perfect Robinson Crusoe flair. Find a coconut or catch a fish. Indulge in the peaceful atmosphere. You can catch a great view over part of the island from the viewpoint at Triad. A sign indicates non-dining guests will have to pay 20 PHP entrance fee. We just got some drinks – the food was too expensive for us but it looked very nice – but actually, nobody seemed to care about collecting any entrance fee. There was a little bakeshop as well, but it looked like they already sold everything as the shop was very empty. There were no other guests when we visited. It’s maybe not surprising, seeing how hard it is to find the place. Halfway up, the road is no longer paved so expect a bumpy ride.